Are you between the ages of 18-24 and still need your GED? 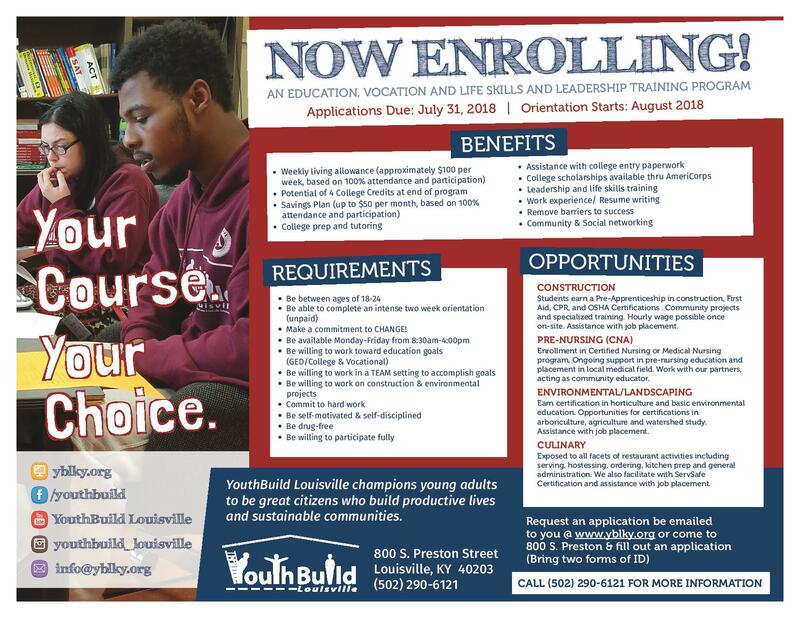 YouthBuild Louisville may be a fit for you! We are currently recruiting for our next class and invite you to check out our program. There's still time to apply before our next class starts! See our recruitment flyer and learn more about the program. Ready?! Get your application in today! VERY IMPORTANT: Once you submit your application, you will be contacted by a member of the YouthBuild Louisville team. While you are waiting, GET READY by collecting all your needed documents! You will need to have two forms of ID and the information listed below in the FORMS section. If you do not have this information when called for an interview, your enrollment may be delayed. Start getting all the forms and documentation together TODAY!